I am a certified SoulCollage® facilitator. I’m starting a new SoulCollage® group. Use your creativity to grow, explore and play. Let the images of your soul and heart emerge. Experience the deepening of connection to others. SoulCollage® is an intuitive and imaginative way of playing in the realm of Soul. We sort through, rip and cut, shuffle and paste a wide (and wild) variety of images from magazines, books, etc. We respond to images as they call to us. We slowly build our own deck of soul cards, meeting and greeting the various manifestations of our unconscious, and beginning to relate with different players in our inner theatre, some of whom are guides and allies, others of whom are challengers, still others of whom have come to us for healing. It is good to meet the Many who make up the One we usually think we are. So much for the static, in-control self! Groups and workshops are a valuable part of any healing path. A group allows support and connections to develop among its members. As the members of a group hold space for each individual and his or her experiences, they come to know parts of themselves that are similar, and ways that they are different. Groups help us to grow in the context of relating, as well as in the areas focused on by the group. SOULCOLLAGE® is a trademarked process created by Seena Frost. 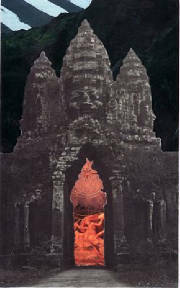 For more information go to www.soulcollage.com.